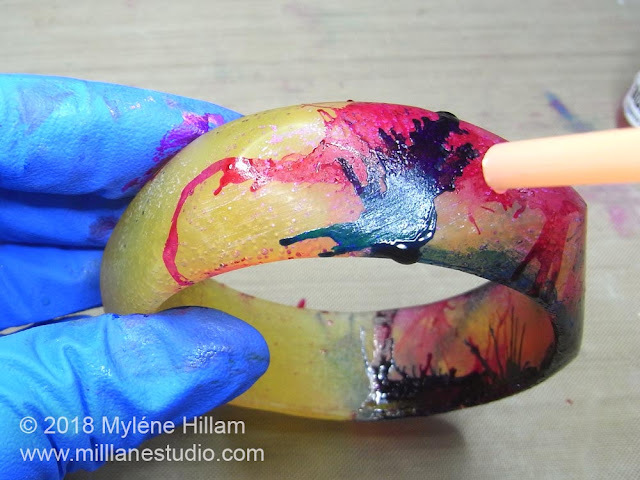 What do you do when you've made a resin bangle and it hasn't turned out very well? Maybe it's filled with bubbles, or the colour isn't what you want, or there's some other blemish that you wish you could hide. Today I'm going to show you a trick I sometimes use to disguise imperfections. And it looks absolutely stunning! 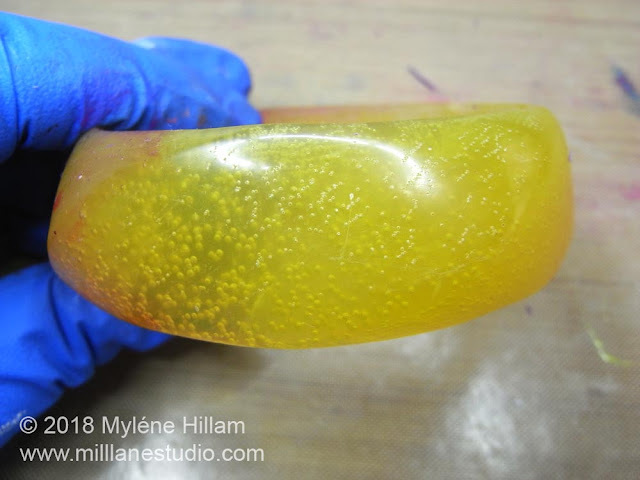 I'm starting out with a bangle that is full of bubbles. Other than the bubbles, there's nothing wrong with the bangle. This is a messy process and I like to work on a non-stick craft sheet because it's so easy to wipe clean afterwards. Before you begin, put on your gloves. Apply a drop of one of your chosen colours onto the surface of the bangle. Whilst it's still liquid, blow through the straw to make the ink splatter and spread. Take a second colour and do the same thing. You can overlap colours if you like because dried alcohol ink is reactivated by wet alcohol ink, so the colours will blend. Cover the whole bangle in this way. 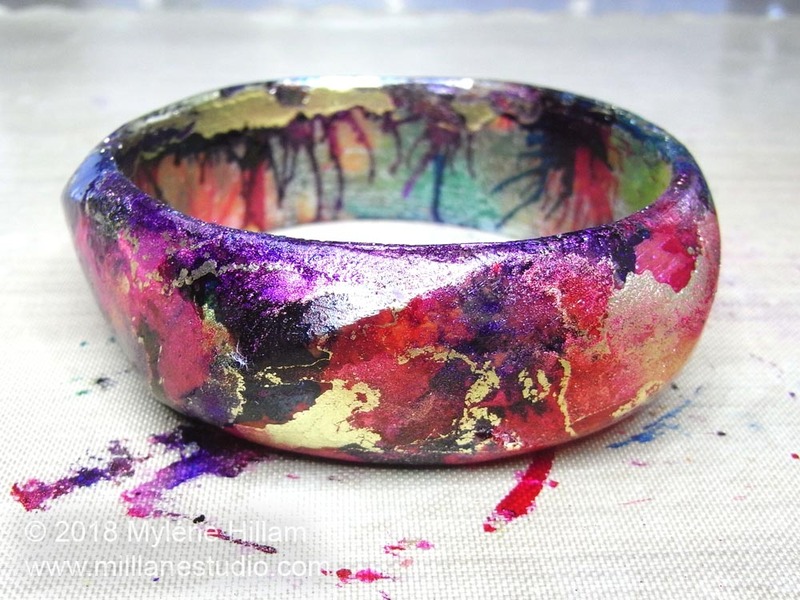 If the alcohol ink gets on the inside of the bangle, blow the ink until it splatters and can't be spread any further. 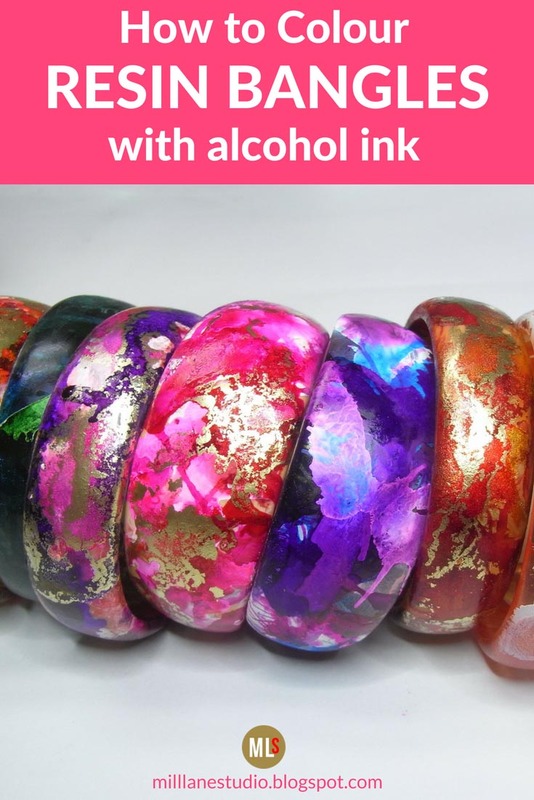 Apply a couple of drops of metallic alcohol ink. It will run but that doesn't matter. Now, immediately add a drop of Claro Extender to the metallic ink. 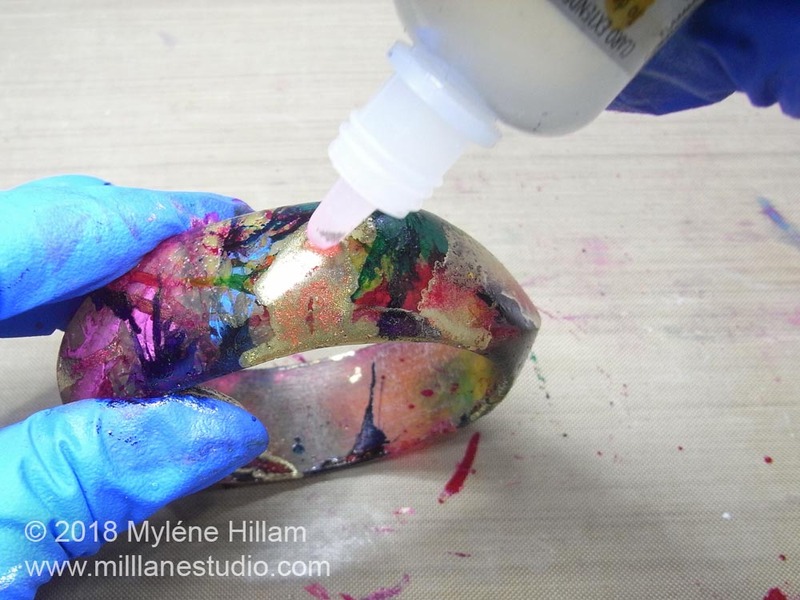 It will keep the ink from drying too fast. It will also reactivate the colours underneath. 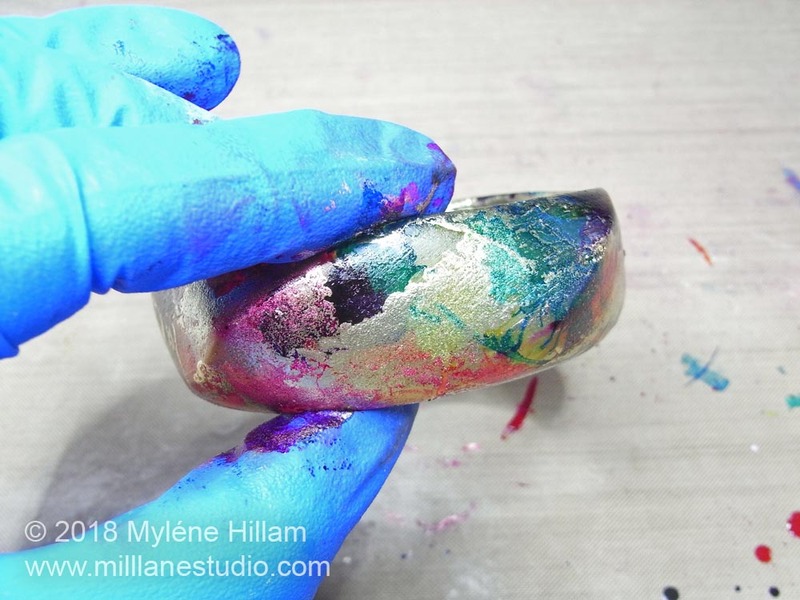 Position the straw over the metallic ink and blow it around so that it disperses across the surface of the bangle. 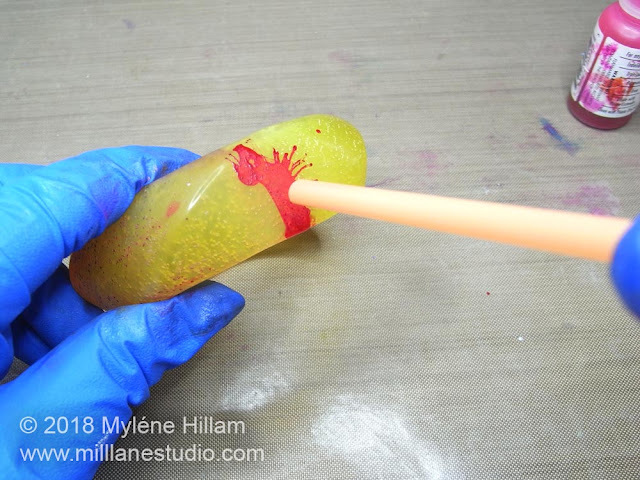 It will create a rich ripple or marble effect. You can also try blowing it around without using the Claro Extender for a more solid look. 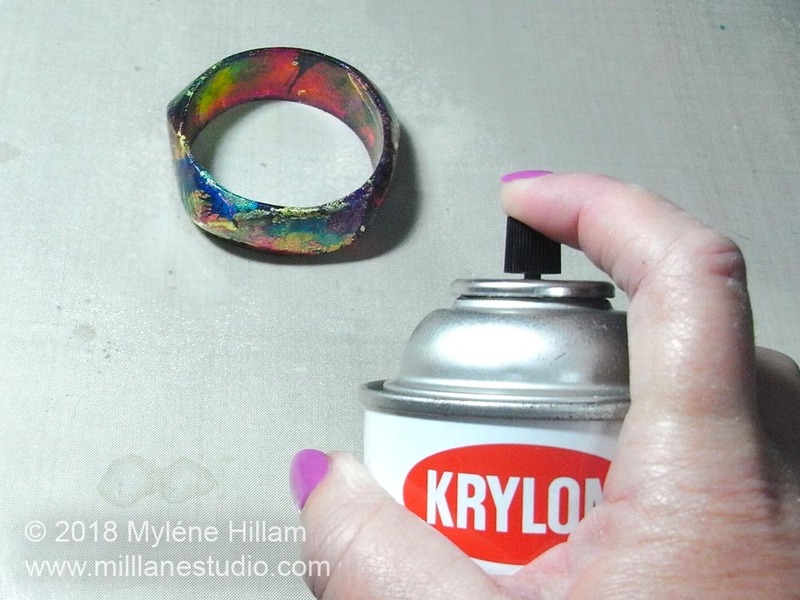 Apply the metallic ink over other areas of the bangle. 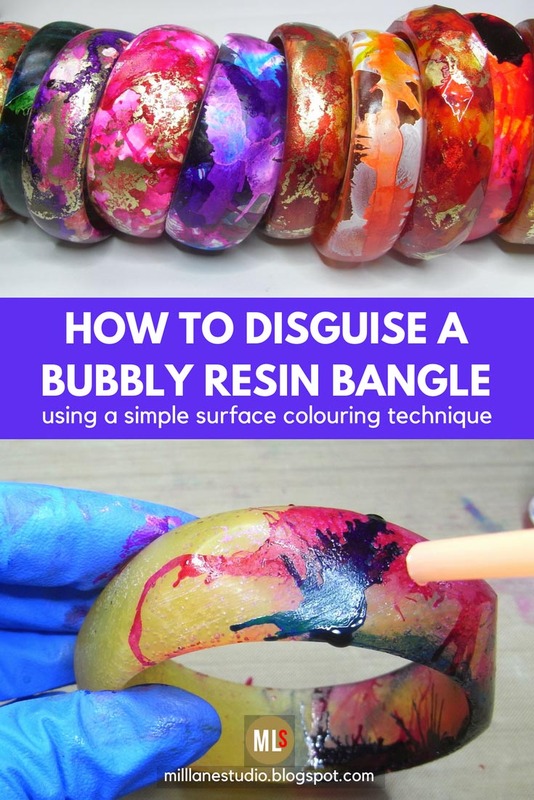 Disperse any excess on the inside of the bangle too. You can see how it's lightened some of the really dark areas of alcohol ink. 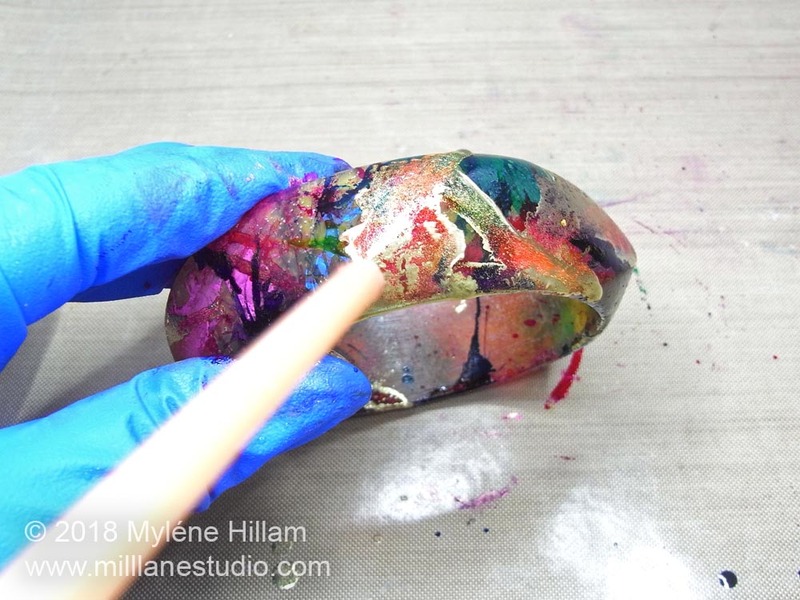 Now you need to set aside to dry. 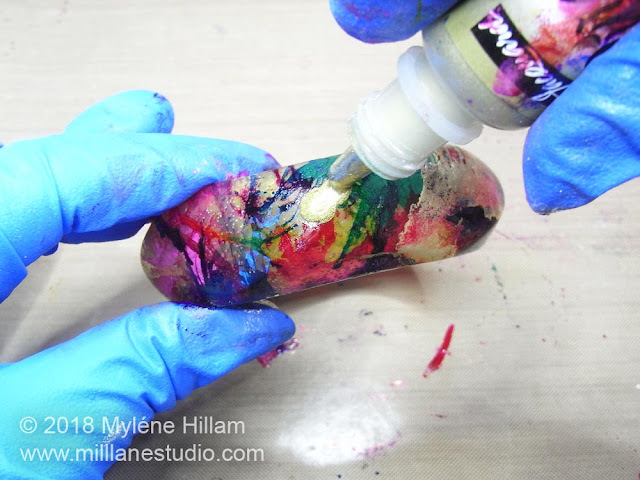 Alcohol ink dries pretty quickly, but if you have really piled on the alcohol ink, leave it to dry for a few days before the next step. This next step is optional but if you choose not to do it, then see the note at the bottom of the post. 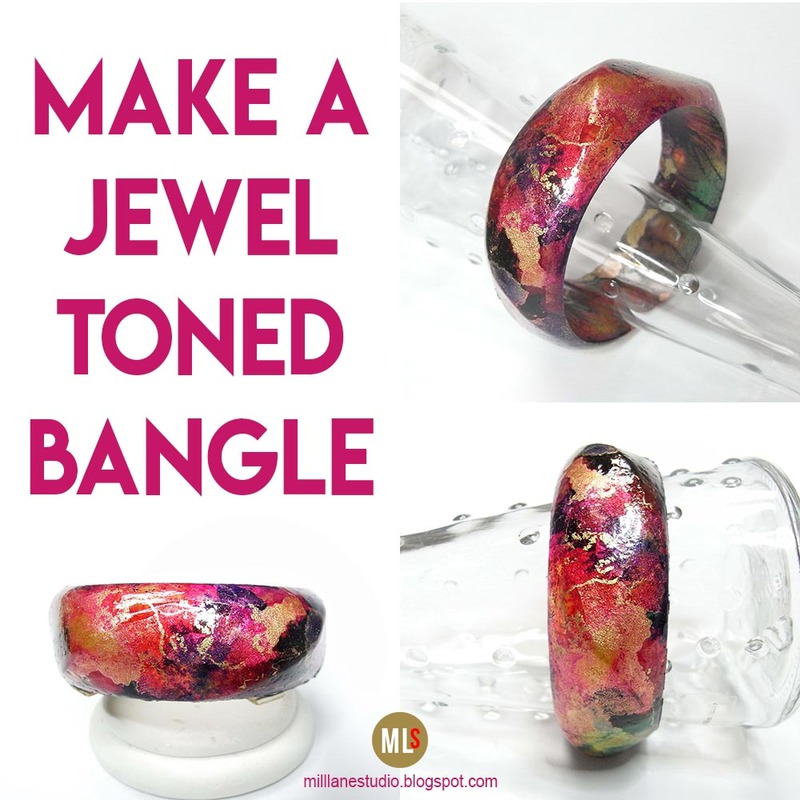 Put the bangle on some newspapers or a plastic drop sheet and spray it with a couple of light coats of Krylon Triple Thick Crystal Clear Glaze, allowing each one to dry before applying the next. Note: If you choose to skip the sealing step, then make sure that you keep all alcohol away from the bangle. There's alcohol in a lot of products that you might not even think of: cleaning products, perfume and hairspray, to name a few. If you don't want the alcohol ink to get reactivated and rub off onto your skin and clothes, then sealing the bangle is the way to go! Love this project? Then Pin It!